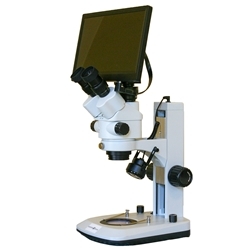 The Richter Optica S6LCD-BL is a stereo zoom microscope with zoom magnification of 7x - 45x on a compact LED dual light track stand with a HD 720p camera and 12" HD monitor for viewing live images or capturing images. Head: Trinocular body. Viewing head rotates 360°, locks in place by tightening set screw. Includes 0.5x c-mount adapter. Eyepieces: Includes widefield 10x / 20mm high eyepoint eyepieces. Interpupillary adjustment from 50mm to 75mm. Dual diopters on both eyetubes. Eyepieces accept 24mm diameter reticle. 15x and 20x eyepieces are available and can be ordered below. Objective Lenses: Zoom range of 0.7x - 4.5x. Total Magnification: 7x - 45x. For alternate magnifications eyepieces can be changed and auxiliary lens added to stereo microscope. View magnification chart here for details. Specimen Stage: Supplied with 50mm glass stage plate. Stand: Rugged cast metal frame with white enamel finish - head moves up and down on track stand with total Z-travel of 4". Built-in top and bottom LED illumination. Focusing holder has top LED light built into it. Bottom LED light shines up through stage plate. Focusing: Rack & pinion focusing and special tension adjustment located on focusing knobs to adjust tension. Illumination: Transmitted and reflected LED illumination with intensity rheostat control and on/off switch for each light. Size & Weight: Base is 7.25" W x 10.75" D, 13.5" H, 10 lbs. Camera: Live resolution 1280x720 pixels. 1 megapixel image capture resolution. Video capture resolution 720P (HD). USB output. Live image at 720p / 30 fps. Image capture to SD Card (not included). Camera controls for exposure, gain, white balance, color adjustment, sharpness. Includes mouse for on-screen controls. HDMI direct connection to monitor. If connecting to another HDMI monitor, you must be able to set the monitor resolution to 1280 x 720. LCD HD Monitor: 12" LCD HDMI monitor, 720p. LED backlight. Monitor mounts directly to the HD camera and includes 110~240V power cord and HDMI cable. Warranty: 5 Year warranty on microscope, 1 year on camera and monitor.